And holy sh*t is all I could say. I sat staring at the screen for five minutes without moving, trying to fathom the astronomical amounts of money I was seeing. After coming back to earth, my eyes started wandering down the clock to see the various forms of growing debt. The US government debt, yearly deficit, citizen's debt, is scary. First, let me explain how much money we're talking about. I actually had to look up what comes after a trillion. Here is the exact screen shot that made me sit dumbfounded. 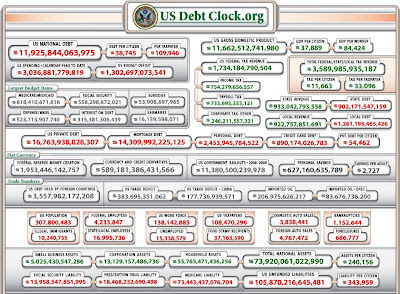 I found the clock over at US Debt Clock.org (links below). However, realize that you're simply looking at an image. What I saw was more harsh. Were you able to handle it? Did you read through all of the numbers? That was taken on Wednesday, October 28, 2009. What is the date today, and how much has it risen? This is what might boggle your mind like it did mine. Click on this next photo to go to the www USDebtClock org site. Not only will you see what you saw above, but it will be be climing as you watch it! If you don't know what a certain number means, simply run the mouse over the number and an explanation will pop up. How does that make you feel? If your son or daughter were born today he would be nearly $40,000 in debt if we divided evenly amongst all US citizens the $12,000,000,000,000 (trillion, I just wanted to write out all of those zeros). Staggering, isn't it? The US has over $100 trillion in unfunded liabilities, which includes Medicare and Social Security. Many soon-to-be retirees are worried the government will soon be unable to pay. $3.5 trillion of the $12 trillion US debt is held by foreigners. What happens when these creditors start demanding the US government to pay up? Look at"Federal Reserve Money Creation" on the left hand side. Do you see how fast this is rising? They are printing money at a rate of $60 million per hour. This is why our palladium coins and gold bullion have been rising in value and why inflation has been a part of life since 1972 (before which the dollar was backed by gold). Eventually we will see gold, silver, and all other commodities reach astronomical heights. Technically, they should be much higher than they are now, but thus far people are trusting the US government to eventually pay its debts and things are still semi-stable. I'm not going to write a book here. This is a choppy article of my thoughts; what went through my mind when I looked at the clock. I've read a lot of books about the economy, business, commodities, stocks, etc. Some of these books are from 2003, some are from the 90s, some are more recent. The other day I read one from the 70s when the debt was just a few $billion. Many mention the total US debt, which just a few years ago was $2-3 trillion. Now, it's $12 trillion and I'm just astonished. Finally, here's a picture of the US Debt Clock pasted on a wall of a building in New York City for everyone to see. "The idea for the clock came from New York real estate developer Seymour Durst, who wanted to highlight the rising national debt" (http://en.wikipedia.org/wiki/National_Debt_Clock). Click to read the full story about the clock. What does this mean? That there are too many people in the world; there is too much money backed by no solid assets; there are too many people in debt; here is too much pollution; there aren't enough resources....I could go on. But the fact is that our society has become extremely complex in terms of the economy, resources, and population. Something big is going to happen in our lifetimes. And some of us will be prepared. On the day the Federal budget cannot even cover the interest of the debt, the Treasury of the US will declare "Force Majeure" (reputiation to pay the debt), once that happens the US dollar will be demonetize by the Treasury. That means the US dollar will go back to its intrinsic value of ZERO, no country on earth will accept it, and therefore this will be the death of the dollar unfolding in our very eyes. Scary huh?